I got to work a little early this morning. I was frittering around. I checked Twitter. Then I started to plan out my work for the day. I looked at our desk schedule, and spotted my name slated to do the drop-in storytime. Gah! Summer Reading, you did it again! I have been crazy busy for the last two weeks. I completely forgot to plan for this. Luckily, at this point, you could shake me out of a deep sleep, yelling, “Cate, you have storytime in 30 minutes!” And I could pull together in time…as long as there is some form of caffeine available. So I poured one of my emergency Red Bulls down my throat, and got to work. I was about to close Twitter when I spotted this tweet in my feed. Recently, I’ve developed a sort-of formula for choosing books that strike a variety of emotional tones in a storytime. I find it works particularly well for a storytime serving a wide age range like the one I had today–8 months to 7 years. I find that this allows kids and their parents (esp newbies) get comfortable with me, and helps us all focus our attention on the content of the stories we read. I start with a sweet, simple story. Then I move onto a silly story. And I end with a well-written, and somewhat challenging informative nonfiction book. Then they all scootched up close to me. And they loved this story…even the little, little kids were totally engaged the whole time. They asked great questions. They wanted to know what every word meant. Anyway, enough about all this noise, it’s Flannel Friday! I used felt to make an adorable plushy octopus a little more anatomically correct, and used it as a prop. We’ve had an adorable little octopus for years. 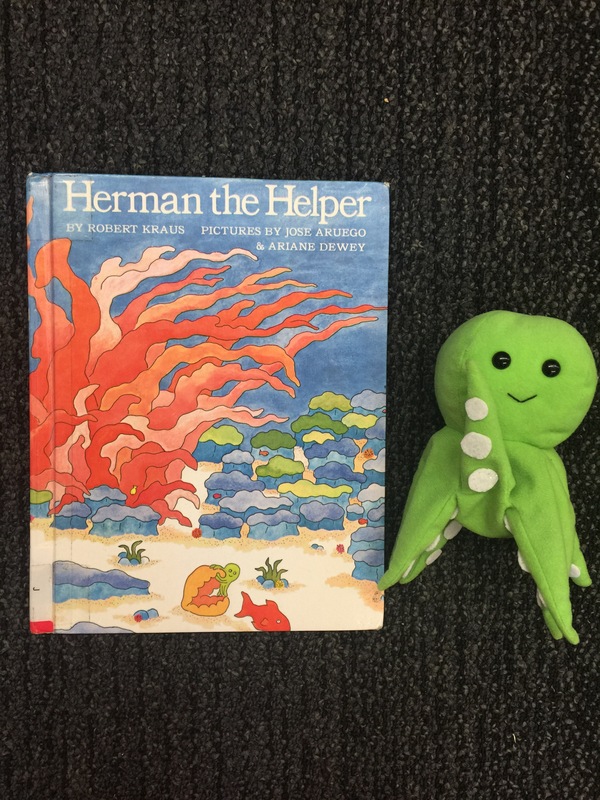 As I was pulling out one of my favorite storytime books, Herman the Helper by Robert Kraus (public library) I realized how much this little dude looks like Herman. But as I skimmed through my nonfiction selection I realized there was something missing: his suckers. So I grabbed some self-adhesive felt. I cut little circles, and stuck them on to all of his legs, and voilà! Mollie of What Happens in Storytime is hosting the #FFRU this week! Thanks, Mollie! If you’re looking for storytime ideas, the Flannel Friday Pinterest archive is a bottomless pit of brilliance. And if you was to join the party the Flannel Friday blog has all the information you need to dive in! The water is fine, after all. 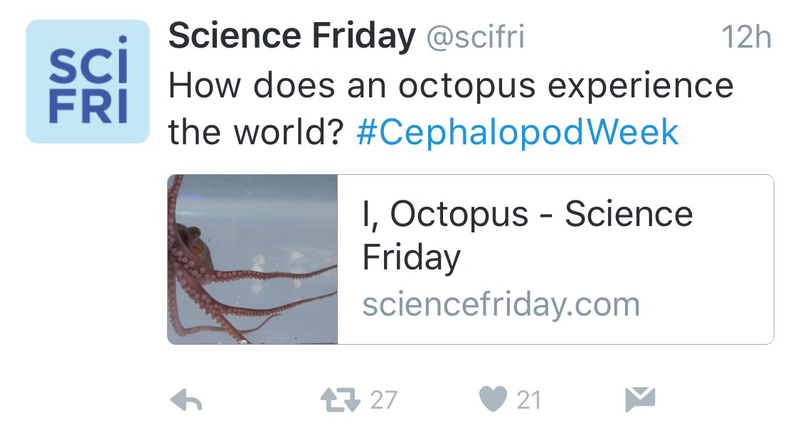 Categories: Flannel Friday | Tags: cephalopods, Science Friday, storytime | Permalink.